Neelfyn closed this discussion on 26 Feb, 2015 08:09 PM. I asked our developer to look into this. It looks as if the general consensus is correct. The site is using that "error" to try to get users to disable their ad blockers. 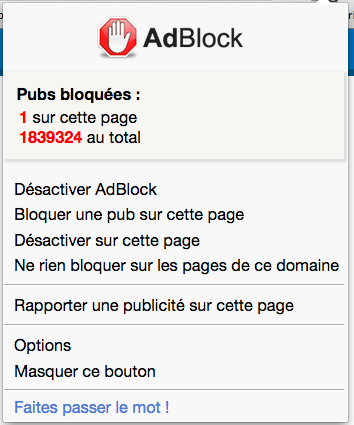 Neither AdBlock nor Adblock Plus (ABP) does what the site administrator claimed. If there IS a conflict, it's not something our developer was able to discover, which suggests it's buried very deep indeed. This is likely only a temporary solution, until the site finds another way around ad blocking. You can also try the suggestions in our Knowledge Base article, A website is telling me to disable AdBlock before it will show content. Rhana closed this discussion on 16 Mar, 2016 04:18 PM. (that is, omit the ` at the start).